High Speed Train Route Dominates Our 2016 Stories. LymeLine Opinion: Now It’s 2017, What Happens Next? You are here: Home / News / High Speed Train Route Dominates Our 2016 Stories. LymeLine Opinion: Now It’s 2017, What Happens Next? It’s a New Year, which brings an opportunity to review and reflect on the previous year, and to make plans for the new one. We have covered so many topics throughout 2016 that we decided to enlist the help of Google Analytics to determine which have generated the most interest among our readers. various controversies surrounding the construction of the boathouse at Rogers Lake. But far and away the highest number of pageviews generated in 2016 came from stories related to the proposed high speed rail track. Seven of our ‘Top 20’ stories in 2016 were about one aspect or more of the Federal Rail Authority’s (FRA) high speed train proposal with our 2016 #1 story being Greg Stroud’s Op-Ed piece back in January, which, in our mind, really sparked the whole general awareness of the situation. That single story generated almost 6,000 pageviews. 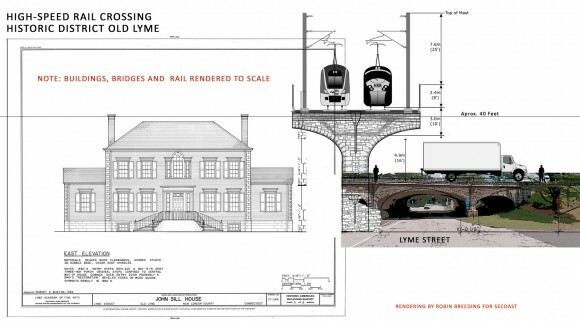 This widespread interest in the high speed train route culminated on Dec. 19, 2016 with the announcement by the FRA that, despite more than 1,000 letters of protest from residents of Old Lyme, their Preferred Route was, after all, through Old Lyme … but now in the form of a tunnel. The FRA has, however, also refused to eliminate the possibility of the aerial track that it originally proposed, which seems a likely fall-back position for the FRA since the organization, as far as we know, has done no — yes, that’s zero — research into the practicalities of digging a tunnel under the Connecticut River estuary. The announcement of the Preferred Route on Dec. 16, 2016 brought with it a 30-day deadline for raising comments, but unlike the comment period that accompanied the initial draft proposal announced back in December 2015, the FRA has no obligation to respond to any of the comments raised. We know that SECoast.org, the non-profit “organizing and educating the public to protect Southeastern Connecticut and the Lower Connecticut River Valley,” and the Connecticut Trust for Historic Preservation have together filed for an extension of the 30-day Comment Period by an additional 60 days taking it from Jan. 31 to April 1. The extension is critical to allow more people to contact the FRA to express their concerns about the route and for more detailed analysis of the proposal to take place. It is patently clear from the timing of the announcement of the Preferred Route (nine days before Christmas) that the FRA is hoping only a very limited number of people will bother to file comments this time, especially since the FRA is not required to respond to them. Then they (the FRA) can argue that Old Lyme is not only placated but probably supportive of the proposal. We also know that our elected representatives US Sen. Richard Blumenthal, US Congressman Joe Courtney, State Sen. Paul Formica (R- 20th), and State Rep. Devin Carney (R-23rd) have all been fully supportive of efforts to persuade the FRA to reconsider the Preferred Route and we are greatly appreciative of their actions. Similarly, the first selectmen of Old Lyme, Old Saybrook and East Lyme along with some other local state senators and representatives have all publicly denounced the proposal and we much appreciate that too. There has also recently been a considerable surge of interest and active concern expressed by organizations in Rhode Island. These include The Nature Conservancy of Rhode Island and the Westerly (R.I) Land Trust. But what has happened here in our own backyard in terms of specific actions to express concern to the FRA regarding the Preferred Route? We are fully aware that a great deal is surely happening below the radar regarding train route negotiations and respect the need for that, but in the interests of our readers, we have some questions. Have the boards of selectmen of Old Lyme, East Lyme and Old Saybrook also filed for a 60-day extension to the Comment Period and/or approved motions expressing their deep concerns about the proposed route? Have the Connecticut branches of The Nature Conservancy and Audubon Society, the Roger Tory Peterson Estuary Center or the Connecticut Fund for the Environment and the Old Lyme Land Trust issued any sort of statement regarding the proposed route and/or requested an extension to the Comment Period? And what about the Lyme-Old Lyme Chamber of Commerce and the numerous art and other non-profit organizations in town — have they each written and requested an extension to the Comment Period? We do know that a team has been appointed by the Old Lyme First Selectwoman to study the impact of the Preferred Alternative, but we do not know who its members are or the nature of their work. We sense a Town Meeting in Old Lyme might be helpful for residents to come together and hear from the Old Lyme Board of Selectmen (BOS) about the work currently being undertaken by the team and how the BOS intends to respond to the FRA Preferred Alternative. It is important to understand that the FEIS is Approved. That the 30 day period is not a comment period. The FRA is under no obligation to read further public input, and will not respond. The 30 day period is a “waiting period”. During this period, forms will be filled out, errata sheets issued if required, and items left unclear in the FEIS will be clarified. But THAT’s IT. The fact is a federal agency has published a public document that has a representative route for a train coming right gown Halls Rd. in Old Lyme, crossing the Southern part of the USCG Academy property in New London, and going right over the access to the Mystic Aquarium and the Mystic Seaport area.